I am enjoying this moment. Chocolate chip pancakes are all in happy tummies and the kitchen is cleaned up. Allison is curled up on the couch snuggling with Midnight her new guinea pig (more on that in a moment) and there is temporarily only happy sounds in our house. Robyn has come up with a new torture this week that involves a constant whine. I am sure it only seems like she is constantly talking and in a very loud voice. But it seems like I and Jeremy have said "just stop talking" to Robyn WAY too much this week. I either need to develop a higher tolerance or laugh about it more! Yesterday was one of those days where Jeremy and I sit on the couch with kids in bed at 9 and just look at each other and say "it was a great, busy day and now I am pooped out!". I went to a Relief Society event in the morning, then back to have us all go to Spencer's last basketball game, picking up celebratory team doughnuts on the way. Jeremy and Spencer were able to go to the last BYU basketball game and cheer and boo themselves hoarse and have a great time. Girls and I cleaned the office partway, boys finished that night. Taylor and Meredith went out for ice cream with Taylor laughing and clapping the whole way at having Meredith all to himself. It might have also been the lack of screech girl voices, but perhaps I am projecting. Allison had a friend over for a late night and along with Robyn we headed to the pet store. Our original goal was to find a cat proof hamster cage that we could lock. But we were convinced that a guinea pig would be a hardier, better pet for Allison and since we already had to buy a new cage... So Allison adopted a black female guinea pig that she named Midnight. 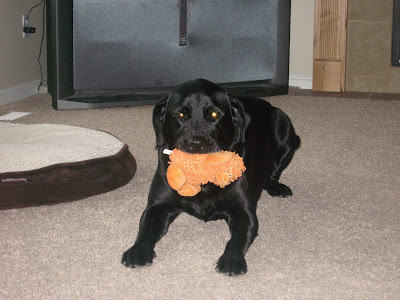 It snuggles up with her and is constantly squeaking to her with contentment when she pets it. So Allison is just beaming and Midnight is getting lots of love. Yesterday though made me really appreciate our friends. One friend went and picked up the basketball tickets for Jeremy. Another friend drove Jeremy and Spencer down to the game. Another friend came over to fix our broken kitchen drawer and wouldn't let us pay him. And another friend, our home teacher, showed up with a pie and tickets for a U of U gymnastics meet in a few weeks. All I could think of was how lucky we truly are in our friends. It was a little bit of a churchy week. Wednesday night we had a late night ward temple night where we first met with the Temple Presidency and then attended a session at 8:30. It was really neat but made for some yawns Thursday morning. Thursday was our big Stake Relief Society meeting that we have been planning. We had Sister Thompson of the general presidency come speak to us. First she spoke to all the laurels and their moms and then to all the sisters. It was a 4 Stake event so I was a little surprised that we didn't have to use all the overflow rooms but everyone left with smiles on their faces, so I would call it a success. Been working this week to clean up some projects. I finally finished up the girls' aprons. I made all the girl cousins aprons for Christmas but my own girls got theirs just a bit later. On the plus side I think they keep getting cuter, the more I make of them. Robyn still coughs when she first wakes up in the morning but it keeps getting better. First part of the week she was up a lot coughing and not being able to stop. Hence a week of crabbiness. But by mid-week she was back at preschool and having friends over. Kids are all good. Allison is playing with friends as much as possible. She had two after school play dates this week which means she is doing piano and homework after dinner. Makes me realize how much I like our get everything done right after school routine. She was excited this week that she tested out of Lincoln's in class reading program. They are going to let her go with the third graders for reading time and see if that helps keep her from getting bored. Spencer is either reading these James Patterson for kid books he found or working on his comic sketches. Lately he has a hard time concentrating if there is any other noise going on. Makes him very upset. I am sure he or us will learn to deal with it. His biggest news of the week is that he got a 100% on his math test - his first time ever. Cut his hair this week and filled up our dustpan. Its so nice to see his face again. Taylor has been signing more at school really well if cut up oranges or pineapple are being offered. His feet are almost healed up. They are teaching him to carry a small basket as he walks - a more functional task. Friday I was able to go to breakfast with two of my best friends, Kate and Allison at Kneaders. Combine amazing french toast, good friends, a little girl happy to sit at a table with a cookie, a box of my little ponies and her friend Tally for an hour and a half and it was a wonderful morning. They had a plaque there I really liked: "Money can't buy happiness, but it can buy Kneaders which is sort of the same thing". Jeremy continues to work hard and balance work, family, church and photo stuff. He had one photo shoot this week. And he had one photo night where he attended to do a dry run of the video broadcast for his upcoming photo camp. He just doesn't have enough hours in the day. This week we get to see my brother Daniel and his family. All of us are counting down the days and its forcing me in a good way to deal with all the cleaning up/fixing things I keep not doing. And delegating to Jeremy the most unpleasant one of getting our garbage disposal working again and fixing the ice maker. This was my Grandma Drechsel's recipe and one of my kids' favorites. My Grandma seemed to make it whenever we would visit because it was easy to feed a crowd of kids. Jeremy likes the leftover bean mixture to eat with chips for his midnight snack. Cook 1 lb hamburger with 1 chopped onion. Drain. Add 2 14.5 oz cans refried beans, 1 14.5 oz can crushed tomatoes, 1 package taco seasoning. Heat, stirring often. Serve over crushed tortilla chips. Top with: shredded lettuce, shredded cheese, corn, tomatoes, sour cream, avacado, ranch, salsa, pepper and anything else that sounds good. Nothing big happening this week. No huge traumas or things broken. Robyn has been down with a cold the last few days but it is just the kind that makes her cranky and have a horrible sounding cough. She thinks she is fine and is most upset when I won't let her play with her friends. Monday the kids were our of school for President's Day. They were happy to spend the day hanging out, playing with friends while I tackled laundry. Then Kelly called to see if we could watch Brynn that evening while they went to see Percy Jackson. Spencer and Allison thought that sounded like a great idea. So Jeremy came home a bit early to stay with Robyn, Brynn and Taylor while we went to the movies. A little too intense for Allison as she had me cover her eyes and ended up in our room that night several times. But Spencer just ate it up. It was sort of a tag team FHE as we came home, gave Jeremy a hug and then he was off to a late birthday party for a friend while we went to bed. Tuesday I had Taylor's IEP at his school. It was really inspiring to me to hear of everything the teacher and different therapists are working on with him. They are really stressing having him signal yes or no for things, drinking out of a regular cup, chewing, walking (he is waiting on some new daffos to arrive), keeping his head up etc. Mostly as I realized how much they interact with him and are constantly trying to involve him and solicit reactions from him. The last few years I have gotten into the habit of more taking care of him than of trying to involve him in our daily lives. So I am repenting and trying to do better. For example for mealtime I have gotten out of the habit of sitting down and helping him eat which has led to him sitting there being ignored at times as he feeds himself. They have him walk on a treadmill at school to help build up his cardio and hopefully increase his circulation in his hands and feet. Their goal is to get him to the point where he doesn't bring his wheelchair to school at all. We have conditioned him that his wheelchair is for zoning out in. Jeremy went to a smug-mug event up in SLC this week, to check out the venue for a class associated with photo camp. It was a different photographer group than he usually associates with but he said it was fun. And now he has met the owners in person which is a plus. Nothing better but nothing worse at work right now. Friday was cousin pizza and movie night. Kids had a blast playing together, eating pizza, playing their DS, making peanut butter popcorn. Jason and Kelly went and bought appliances for Lauri's condo while we had kids so we are getting ever closer to being able to list it. Saturday Jeremy and I were able to go see the musical Dirty Rotten Scoundrels. I bought season tickets last summer for the community theater by us. It was hilarious - I don't think I have seen Jeremy smile that much at a play before. I have never seen the movie so the plot was a surprise to me. One guy who played Freddy truly put himself out there for his role including keeping a live goldfish in his mouth until he spat it out into a pitcher. Talk about dedication to your craft! Robyn has been busy as ever and as loud. Jeremy commented this morning that her voice just has that piercing quality even when she is just talking normally. Last night when Meredith was with her she was very grumpy. Meredith told her that when you were grumpy you went to bed so she better spit out the grumpies. Robyn complained that the grumpies were stuck in her with glue. So she ran to the bathroom and started making spitting noises trying to get the grumpies out. When it was time for bed she complained that she wasn't grumpy anymore so she didn't need to go to sleep and ran into the bathroom to make sure she had spat out all the grumpies. Have to love her. First part of the week was running around with friends. Second part of the week was house arrest with an increasingly grumpy Robyn as she tried to get rid of her cough. Spencer at school is doing an Oregon Trail project. He and his 7 month pregnant wife have to decide what to pack, what to do in situations etc. He is really getting into it. Currently he and Allison are playing Clue. I played with them this morning and they haven't stopped since. Somehow discussing weapons and murder has just enough illicit appeal to make it exciting. Spencer had his blue and gold dinner this week that Jeremy was able to attend (Allison had activity days but came in late to snag some food and goodies). Its our last pack meeting - hard to believe. His cub scout shirt almost covers his belly button right now. Need to go buy a boy scout shirt. We sketched out a BYU logo on his wall, now I just need to paint it. Allison is either reading, playing or designing some sort of craft or a maze for her hamster. Her room is constantly covered with little snippets of paper,fabric and library books. Her teacher wrote me a really touching note this week about how Allison makes her want to come to work everyday because she knows Allison will be waiting wide eyed to see what she teaches her. That Allison is a reminder from God that life is good. Before I break out the halo though I remind Allison that she is the perpetual non-toilet flusher in our family. 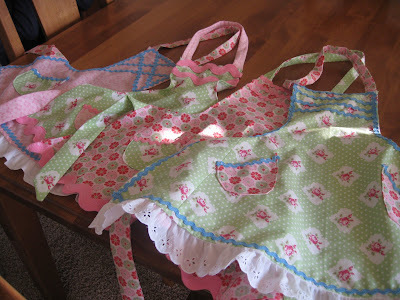 I have been working on finishing up the girls' aprons. I made them for their cousins for Christmas but never got around to making theirs. On the plus side, my skills are getting better so theirs are looking cute. My old neighbor Lisa gave me this recipe. It is one of our kids' favorites and we will often bring it for BBQs in the summer. Calling it a salad is really a stretch but it makes you feel better about eating it. Mix buttermilk and pudding. Stir in rest. Chill and serve. In our family this is called Candy Poop after Robyn thought that is what it looked like last year. Not a great name but it is one of our favorite movie night treats. It can keep but it is best when fresh, warm and chewy. In a saucepan, combine sugar and corn syrup. Stir constantly and bring to a boil over medium heat for 3-4 minutes. Remove from heat and stir in peanut butter and vanilla. Pour over popcorn and stir well. 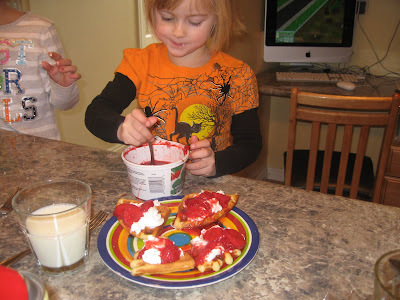 Every year for Valentine's Day we make waffles covered with strawberries and whipped cream. These are the most un-nutritious waffles ever but they are really, really good. They are great to make for company mornings as you do the work the night before, clean everything up and in the morning just pull out the batter and start cooking. Heat the butter and milk on low on the stove or in the microwave till butter is melted and then let cool till warm. Whisk in all the other ingredients. Scrape down the sides of the bowl, cover with plastic wrap and refrigerate for 12-24 hours. Cook on waffle iron. This recipe was from our Stake R.S. president Karen for an relief society luncheon. Mix rice, chicken, onion, celery, water chestnuts and almonds in 9x13 pan. In a bowl, mix together the soup, broth, and mayonnaise. Add to chicken/rice mixture and stir together. Mix stuffing with butter and put on top. Cover with foil and bake at 325 degrees for 45 minutes. Remove foil for the last 10 minutes. Hope you had a great Valentine's Day. 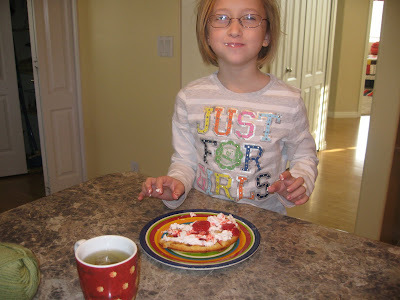 We started off the morning with our traditional waffles, strawberries and whipped cream. Kids went a little nuts with the spray nozzle on the cream but everyone had a smile. Kids have all been making valentine cards, enjoying their parties and candies. Spencer's class voted to forgo their valentines and donate the money to Haiti. But his sisters shared with him so there were no complaints. It seems like spring has arrived early this year. Most of the snow is melted except for a few patches on the shady side of our yard. Spencer and I had some mother-son bonding time yesterday catching up on all the poop scooping. We don't scoop when there is snow. It was quite a long, smelly process. Kids are running around outside whenever possible enjoying the freedom of grass again. 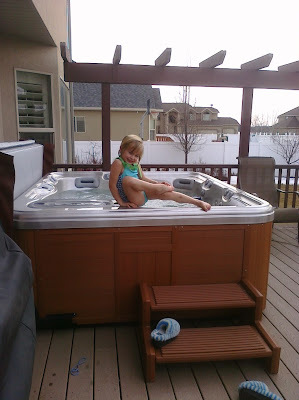 40-50 degrees doesn't sound warm enough to me to, but kids don't seem to care. No big events this week, just some little ones. I painted Spencer's room, we babysat a lot, went to some church meetings etc. Jeremy had a few photography events this week to help combat the stress of work. Spencer had a basketball game Saturday where we got to cheer as Spencer made his first game basket EVER and it was from beyond the 3 point line. Macho got in a cat fight that Spencer tried to break up and now knows that's what we use Rocky for. So Macho had a big cut, in the same place, down to the muscle. Jeremy and I being bad pet owners and realizing that is was after normal hours, put on the cone of shame and used superglue. Seems to be working well! For Jeremy's birthday, I gave him tickets to see Bill Cosby this last Friday. So we went and had an amazing time and then went to grab some cheesecake. It was a great night. 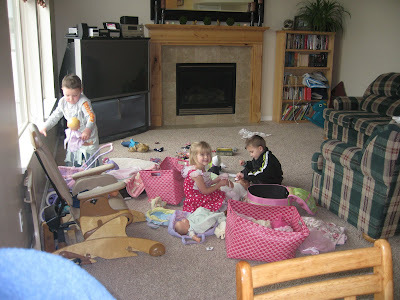 Our kids have had a couple of occasions this week to babysit themselves for an hour or so. They are so proud when they put Robyn to bed and "watch her like a hawk" per instructions. I still feel a bit bad doing it but when Jeremy has a photography thing and I have a church meeting, its nice to know that its an option. Off to cook some steak and potatoes and put valentines chocolates on everyone's plates. I started running this week outside with my new running watch. It tells me how many calories I actually burn. Way too depressing! Think I need to turn that function off. Right now I am at running 2 miles and it feels like a lot. So I am just keeping faith that it will be like last year and I will be up to 12 in a few months. Rocky loves his woobie that he got for Christmas. Jeremy found him whimpering the other day because it was stuck behind a chair. 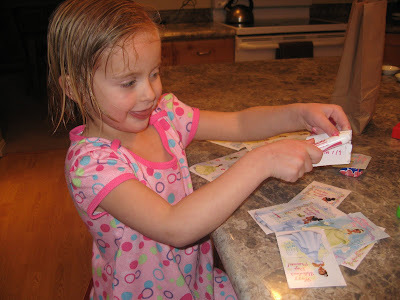 Robyn making her valentines. She got ready for bed SO fast so she could work on them. Finally finished painting Spencer's room. There were a few tears when the magnet board only works with the super strong magnets and can't hold up anything thicker than a picture. But he likes the look and arrangement so much that he soon decided he could live with it. He still wants a big Y over his desk but we are debating between me painting it, which could be scary, and getting a BYU flag just to mount up. Jeremy broke out his camera this morning and Robyn was happy to pose for him. The kicker for me was that she got dressed and did her hair for this on her own. You notice she still has a bit of a shiner from running into a counter. I pointed out to Jeremy that this post was heavily weighted towards pictures of Robyn. He just says its an indicator of who demands the most attention right now! The joys of parent teacher conference is that you get to peek into your child's mind. Two papers I salvaged from the stack of show your parents display on the desk. This letter is for others. There is a family in my ward that is not doing so well. Could you bring them some games to take their minds off their struggle. My grandparents are on a mission in Australia and they love to read. Please bring them some books. Thanks. "My favrite fruit is rasberrys. They are red and juicy. They are sweet and sugery. They are only ripe in the fall. I was in a strenuous hike when I had to hike to swert falls and back 8 times. I was heaving when I was done. Whew! A part of chaos was when I had a sleepover my friend she was going crazy that was chaos. These are Allison's favorite brownies. We made them with pink colored mint frosting for Valentine's day. Cream butter and sugar. Mix rest of the ingredients in. Put into a greased cookie sheet (I usually line it with parchment paper too). Bake at 350 degrees for 25 min. Do not overbake! When cool top with mint frosting: 6 Tbsp butter, 3 c powdered sugar, 3 Tbsp milk, 1/4 tsp peppermint flavoring, green (or appropriate holiday color) food color. When set top with favorite chocolate frosting. We have made this several times in the past for Christmas morning. This is the boys favorite breakfast casserole. Layer: bread, sausage, Jack cheese. Pour mix of eggs, milk, salt and pepper on top. Top with cheese. Cover and refrigerate overnight. Bake at 325 degrees for 40-45 min. This is also from my friend Allison. She has some of the best recipes. Must come from being a dietitian. Brown chicken in frying pan with a little oil. Put in deep casserole dish. Combine rest and bring to a boil for 2 minutes. Pour over chicken, covering all pieces. Bake covered for 1 1/2 hours at 325 degrees. Uncover the last 15 minutes. This is from my friend Allison and is also our Allison's favorite salad. Really more of a dessert but we like to pretend its healthy. Mix in a pan an bring to a boil for 10 min. Stir constantly! Pour into a bowl. Spray a piece of saran wrap with Pam and put it on surface. Refrigerate overnight of for 4 hours. Fold in 12 oz. cool whip and 1/2 - 1 package frozen berries (raspberries are our favorite). Works best if berries are mostly thawed. You can use fresh as well. This is Spencer's favorite dinner. He likes it topped by salsa and sour cream. I prefer mago salsa and my neighbor does avocado, cheery tomatoes and picante. Its good any way you choose. Beat eggs in blender until light. Add flour, baking powder, salt and cottage cheese and blend. In large bowl mix egg mixture, cheese, butter and chilies. Pour into a 9x13 greased pan. Bake 35 minutes at 350 degrees. Serve warm. Kids and I are enjoying a long weekend although it has flown by. Friday was a teacher training day so school was out. Thanks to Jeremy taking Taylor to work with him and a friend taking Robyn, Spencer, Allison and I were able to enjoy a day of skiing. Although it was slushy and rainy at our house, at Sundance it was just slightly overcast. 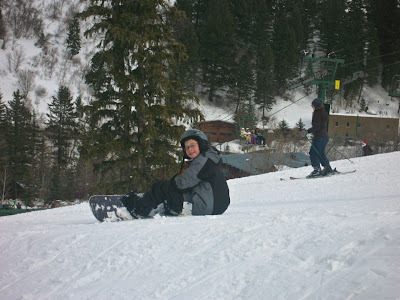 We had a rough first hour which culminated with me having a snowboard size bruise on my back and me chewing Spencer out on the slope much to the entertainment of the lift overhead. Then we had a wonderful 3 hours of doing the bunny slopes over and over. Kids ski/board totally different than I would have predicted. Allison luckily was wearing a bright orange helmet so I could track her progress as she would speed down the slopes. Luckily she proved to me that she could turn and stop so I wasn't too worried about her. Spencer just goes down super cautiously - never falls. But we had a great time. I realized that I haven't written much about Taylor lately. His feet are almost all the way healed up. I took him in this week to have his daffos adjusted and cut back to help prevent future sores. Although now his school thinks he needs daffos with hinges - see how that goes. His school has been using a food grinder to turn all his food into casserole consistency. They think his seizures have gone way down during lunch time because of this. Not sure if that is true but I am trying to be better about mashing up his food. I have been really impressed at how well his school works with him and tries to challenge him to do things. It seems that he does more for them than for me so I need to go be a fly on the wall to see how they are doing things. Rest of our lives were a paraphernalia of daily life. Taking dinner to an old friend and visiting with her and her new baby. Kids having an after school reading party. Spencer going on a scout field trip to the BYU paleontology lab. Jeremy still working to make his job work and trying not to stress. Running kids around to dance and piano etc. Makes the week fly by sometimes. We have Stake Conference this afternoon so for a change Jeremy got to enjoy our ritual of sleeping in and having chocolate chip waffles.